Bare patches, pest infestations and out of control weeds could be telling you that it’s time to re-sod your lawn and start fresh. There’s no doubt, we love our lawns here in Texas. There’s just something about the lush green space lawns create around our homes. While many consider lawns to be a wasteful use of space, they actually have many positive environmental benefits in the urban environment; they cool the air around our homes and reduce reflected heat, reduce soil erosion, remove contaminants from water runoff, absorb pollutants from the air and convert carbon dioxide to oxygen to help clean the air just like your trees do. Plus, they give our kids and pets a soft place to play. Even though extreme weather events can kill an established lawn, it can last for decades if it’s well-maintained. When improperly managed, lawns can die out from pest, disease and weed infestation, and even soil compaction. Without swift and thoughtful rehabilitation of your sick lawn, including a keen focus on soil health, it can quickly decline to the point of no return. If you’ve been spending months, or even years, trying to rehab your lawn, it could be time to replace it with new sod, and perhaps a new grass variety that is more suitable to our climate and your family’s needs. Bare patches and weeds are signs this lawn has been neglected for years. Could be time to start over! Pest infestations: Insects will attack weakened lawns from improper care. Pests such as chinch bugs or grubs can quickly move in and kill off large swaths of grass quickly if not identified and treated within the season. Infected lawns: Lawn diseases such as Brown Patch Disease or Take-All Root Rot infect lawns that are overwatered, have compacted soil and are not properly managed. If large areas of your grass are infected with a disease, it might best to replace the lawn entirely. 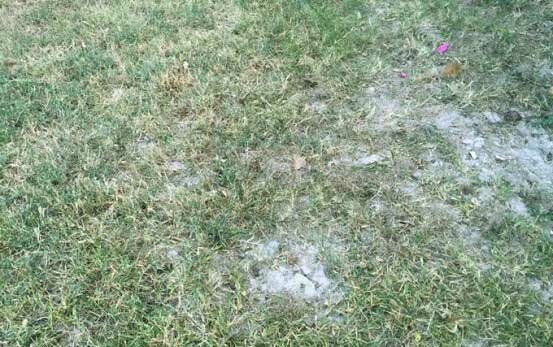 Bare patches: Do you have large patches of bare soil in your lawn? While you could simply try and patch these areas, that doesn’t fix the core problems affecting the lawn. Most likely, the bare patches will just return. Bare soil is also a good opportunity for weeds to take over, causing another layer of problems to manage. Large areas of soil with no grass are often a good signal that it’s time for a full lawn renovation. More Weeds than Grass: Weeds can tell you a lot about your soil health. An overabundance of weeds is a sign your lawn is weak and your soil is most likely compacted and needs organic matter. Vigorous lawns growing in healthy soil will naturally out-compete weeds. New home, new lawn. Did you just purchase a new home? Chances are it probably looked good when you bought it. But, did you have the lawn inspected when the home was inspected? Shade trees, drainage problems, poor grading and improperly designed irrigation can all mean the ultimate demise of your brand new lawn. It’s best to identify these issues quickly, before the lawn declines. Installing a new lawn can be daunting, but sometimes it’s the best solution. Starting anew gives you the opportunity to get a better handle on overall soil health, better irrigation practices and choose a lawn type that’s best for you and the surrounding growing conditions. If you are considering installing new turf, enrolling in our Soil Building program is a good first step. Call for a consult on how healthy soil grows the best lawns in North Texas.